What do Terrano II spares cost? 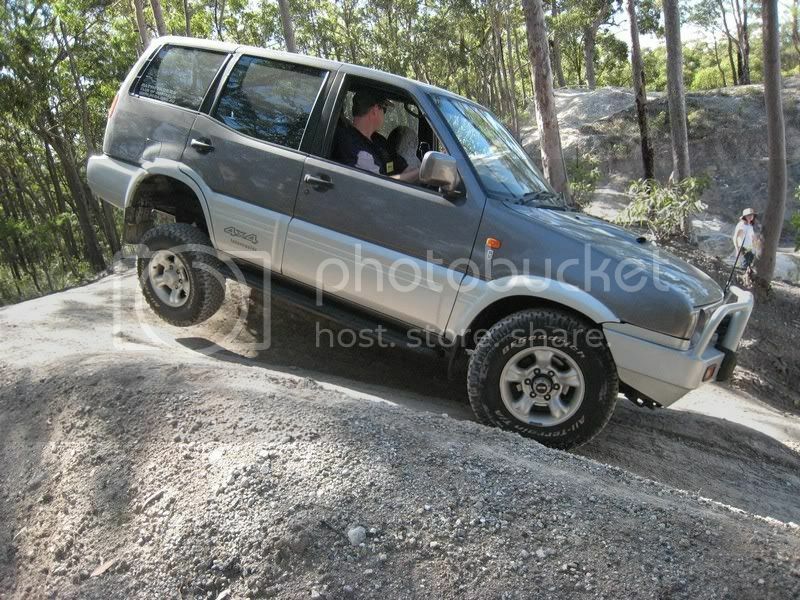 Hey guys I am new to the 4x4 scene and I am thinking of getting A forby wagon instead of A ute and I really like the look of the Terrano and pathfinders but I have heard the Terrano's can be pretty pricey for spare parts and repairs since they are imported and I was wondering if anyone could shed some light on this?. Re: What do Terrano II spares cost? The Terrano's of that vintage will be the only diesels you'll get from Nissan in that wagon style/size, all the Pathfinders were petrol then. You might find one or two Pathie's that have been converted, the engine is a pretty good engine, but not all that common in Aust really. Great vehicles tho, the Terrano's as well as the Pathies!! Part's aren't specifically all that expensive, but it can be a bit harder tracking them down cos there weren't so many Terrano's around and not many parts were bought into the country so you won't get 'old stock' or any breaks that way. And that means that you won't find it easy to get many accessories or second hand parts either, so you might need to learn to do a lot of DIY stuff, barwork, consoles etc. Maybe a Terrano is not the greatest choice for a novice, but certainly a capable and a great small family vehicle and it would be a learning experience as well as a challenge; you could do a lot worse, but you'd probably hafta go 'grey import' to do that. Can you recommend A better starting vehicle? That isn't A patrol or A pajero as I am looking for something that is unique as well as functional. The more 'unique' you go, the more work you are going to have to do yourself, both to keep maintenance & repair costs reasonable and in order to make/acquire the mods & accessories you will want - and that also adds to the cost of getting things like suspension lifts & possibly even odd sized/offset rims & maybe even tyres. So it becomes a bit of a judgement call for you - the Terrano II's are pretty capable and not a bad vehicle, but there won't be a heap of mods or accessories out there for them and you might find tracking down some parts a bit difficult and therefore possibly more expensive. So if you are set on the 'unique' as well as functional bit, that might be something you just hafta put up with - the alternative is to get one of those very capable vehicles out there that ARE more common with the consequentially readily available and identifiable parts, lots of mods & accessories, and probably even a bunch of them in every wreckers yard around the country now - but you could fairly readily and probably quite cheaply MAKE one of them 'unique' in it's own way by modding it yourself. Me, I've done the unique/imported car thing, I've even done a lot of my own fabrication work and made a whole lot of custom mods for my various vehicles over time; and while it might work for a while & for some, there are those to whom or there comes a time when it's not all that appealing, especially if you are short on the readies but still want a reliable vehicle to take out bush every week end, a vehicle that might see a fair bit of mud/need some parts replaced/get a bit of custom panel work done in the bush that needs sorting before you can drive it to work on Monday, and if you start using it as a 4WD, that will happen a bit more often than it might with most road cars. So I reckon I'd be punting for something like a Pajero, maybe one of the better & more common D/C Ute's, or possibly even a GQ Patrol, and making it undeniably MINE & therefore unique that way, secure in the knowledge that if I break something or want to buy rather than build a long range tank & get it plated, or maybe just pick up another alternator or wheel bearing kit when I'm on a trip somewhere, there is a good chance there will be some around somewhere nearby and that I won't be left sitting by the side of the road while I wait for someone to take a week just to find out what bearing kit will work in it or which parts it might need?! Chances are, especially as a novice to the 4WD game, you will be breaking a few things, and you will also probably want to do a few mods to whatever vehicle you get. If you are prepared to do a lot of the parts identification stuff yourself, and track down which bars & snorkels etc will fit your vehicle, or maybe just to make all those things yourself; then a Terrano might not be too bad - but you won't ever have a big pool of spares out there in wrecking yards all around the country, and you probably won't ever be able to find a heap of second hand parts &/or accessories anywhere either. If you don't mind that, then fill your boots, but if you want to be able to get the vehicle back on the road quickly after an embarrassing weekend, or you don't have the facilities &/or want to make most of your barwork, racking, cargo storage, fuel tanks, exhausts etc yourself, then the 'more unique' the vehicle you choose, then I reckon the less likely you will be happy with it over time. Dustyheadache, you refer in the title to Terrano II's, whilst in your post you refer to Terrano/Pathfinders. Which are you looking at, as they are unrelated vehicles? Ah I did not know this, sorry mate, I am thinking of either an older pathfinder as I would prefer an automatic but I can not find one that is diesel. Wow Peter that is a novel of a post lol , Thanks for the advice I think I will look around for something else that is a bit more common for parts and accessories though I still want an automatic but I also like the convenience of a ute but all the Hilux's I have looked at are manual and most have a 2.7L petrol and the one I really like the look of has been converted to a V6 commodore engine (extra cab tray back etc as I am thinking of getting a 4x4 for mild weekend play and also carting my large and small dog around which is where the ute comes into play . Ah decisions decisions, I will head over to the Toyota forum and ask some advice on the V6 engines. The WD21 Terrano is a mostly well designed vehicle, and if you can get one that's been looked after well (almost impossible), they're great. Keep in mind they are getting on a bit in age. I also import a LOT from the US (anything that isn't a motor part, anyway - the diesel was never available in the US). The motor, taken care of, is pretty bullet proof. It's essentially the same design as the TD42 minus a couple of cylinders. It's identical to the TD27 NA in the D21 Navara, with the exception of additional bits with the turbo: intake piping, coolant lines, EGR system. Rust on the body panels under the rear seats is a pretty common issue. Some are quite reasonable, some are damn-near falling apart. Keep in mind that if the suspension hasn't been replaced, you will have a 20-25 year old vehicle with flogged shock absorbers, bushings, ball joints etc. They are known for overheating, which is not particularly fair. They are quite old by now, and many have never had their cooling system overhauled! With a new radiator, thermostat, waterpump and hoses - mine has never moved from below halfway on the temp gauge (except when 3L of water went missing, my own fault). In my experience with these vehicles, it depends what you ultimately want from your 4WD. If you just want to buy it, do the bare minimum to keep it going until it's too costly to maintain, then that can work. If you want something that you can really look after and will last you - you will end up spending a lot on replacing worn OEM parts, and it would honestly be cheaper to go and get a loan for an R51 pathfinder (you'd also spend a lot less time working on it). But if you want something unique, and are prepared to learn a LOT, and sink a LOT of coin on it, then they're a great project vehicle. Admittedly however, my current project is probably roughly at the $12k mark by now - but I'm putting a lot of money into upgrades/overhauls etc, and I have a horrible (read: expensive) habit of over-engineering everything and refusing to cut corners! R20 Terrano II is a brilliant vehicle, I was sorry to see mine go. Because no one knows what they are you will find them cheaper. Parts are a bit hard to track down as when you say Terrano you get a lot of blank looks. But the parts are not that difficult to find if you are willing to do a bit of the leg work yourself. steering and suspension- Navara again. Download a workshop manual, get to know the vehicle and ebay it up! Just never get your spares from Nissan Australia. They are a rip off. Always get your mechanic to get aftermarket for you or check out Ebay. The very first thread on here is about spares for the Terrano. The bloke who posted it did an excellent job on it. It has helped me out so many times.